Please note that custom preset options are available. 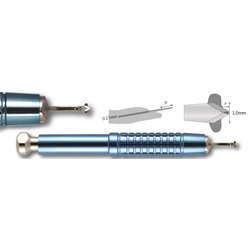 These short-handled preset Donnenfeld truncated lancet blades are available in various desired preset specifications. Blades are at 15-degree angle for better applanation, are 1.0mm in width, and have a winged footplate for superior control. Handle is 100% titanium and measures 2.625 inches long.